Posted November 19th, 2014 by Lynne Lee & filed under How To Hear God, How To Hear God Tips. When I stopped asking God to give me yes or no answers, I actually began hearing much better. He is much more interested in having a relationship with us, and those answers coming out of relationship, rather than Him being like a Guru or it being a business like reasoned decision. We get caught up in the busyness of life and we look for quick answers, we so easily forget that more than anything else God wants a relationship with us, that we were created for fellowship with Him, that our chief end is to enjoy God and glorify Him. 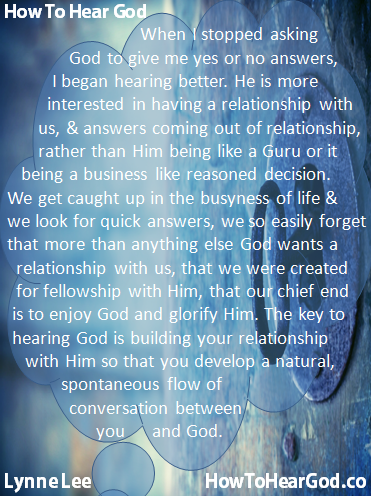 The key to hearing God is building your relationship with Him so that you develop a natural, spontaneous flow of communication between you and God. I encourage you to set time aside to reorder your priorities, to make room for ever increasing conscious connection with God.